A U.S. Justice Department lawyer argued Tuesday that President Donald Trump’s Twitter account is more like a private residence than a public forum where his followers are protected by the First Amendment. Government lawyer Jennifer Utrecht told a panel of the New York City-based 2nd U.S. Circuit Court of Appeals that Trump is acting in an unofficial capacity when he blocks followers, though he sometimes makes official pronouncements in tweets, report the Washington Post, Courthouse News Service, Bloomberg News, Reuters, CNN, the Wall Street Journal and USA Today. Utrecht wants the 2nd Circuit to reverse a Manhattan judge’s ruling that held Trump can’t block people from his Twitter account because of their political views. 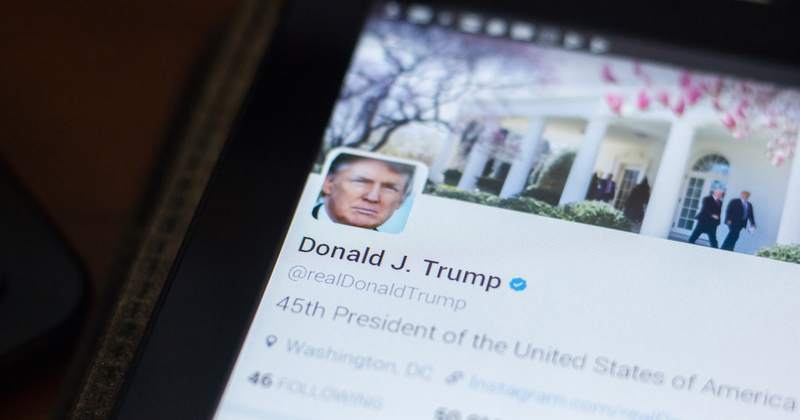 The May decision by U.S. District Judge Naomi Reice Buchwald said the president’s account is a designated public forum, and blocking users based on their political views constitutes impermissible viewpoint discrimination. People who are blocked from a Twitter account can’t see or directly reply to that account’s tweets. Utrecht compared Trump’s Twitter account to the properties owned by presidents before they took office, such as Trump’s Mar-a-Lago resort or the Kennedy family’s Hyannis Port property. “Things happen at Mar-a-Lago that might be official actions, but that doesn’t change the fundamental nature, the private nature,” Utrech said. Trump created his @realDonaldTrump account before he took office. Utrecht said blocking a person was akin to declining to have a conversation with a person passing by. “On the street, Trump could walk away from someone and not hear their views,” she said. One of the judges noted that Trump was represented by the Justice Department rather than a private lawyer in the appeal. “You are here because he’s not a private individual,” Judge Peter Hall told Utrecht. Utrecht replied that the Justice Department was involved because Trump was sued in his official capacity. The case was filed by the Knight First Amendment Institute at Columbia University on behalf of seven blocked Twitter followers. The institute was also a plaintiff.